Healthy knees require continuous motion. However, our generally sedentary lifestyles are at odds with the maintenance of robust knee joint architecture. Left motionless throughout large portions of the day, over time knee cartilage will break down and knee ligaments will become lax. These chronic changes are frequently associated with other degenerative alterations in knee joint architecture often resulting in pain in one or both knees. Increasing discomfort may cause a person to become even more inactive, creating a feedback loop of lower levels of activity and higher levels of knee pain. Paradoxically, the solution to many of these knee problems is to begin a program of progressive and rehabilitative activity that incorporates repetitive knee motion. Continuous passive motion is a primary modality used in rehabilitation of knee mechanics following total joint replacement. Importantly, similar rehabilitative concepts may be applied in the management of many painful knees. The primary principle followed by such rehabilitation is "use it, or lose it." Healthy knees require a continuous flow of synovial fluid throughout the joint structure. This lubricating substance provides oxygen and nutrition to the knee joint, aids in shock absorption, and reduces joint friction. Inactive knees have diminished flow of synovial fluid throughout the joint structure, ultimately resulting in deterioration of joint surfaces and painful arthritis. Thus, surprisingly, chronic knee pain results from insufficient physical activity. As is the case with every physiological process, activity creates a demand for nutrients. Biomechanically, increased motion increases blood flow, which provides oxygen and nutritional building blocks that are required for bearing weight and movement. Increased circulation also facilitates removal of metabolic waste, the byproducts of physical work. The entire process increases the robustness of the local system. Specifically, in the case of knee joints, increased workloads improve the capacity of the knees to do work, creating a new, positive feedback loop. As your knee joints adapt to increased activity, the physiological momentum shifts, in a sense, from a trend toward painful arthritis to a trend toward improved function, greater tolerance for physical loads, and diminished pain. Beginning a daily walking routine will launch this entire process of knee rehabilitation. Start gradually, at a slow, comfortable pace, and walk for 10 minutes. After a few days, your body will begin to adapt and you will be able to gradually increase the duration of your walks. Add a minute or two every few days until you're walking a total of 30 minutes. Then gradually increase your pace, over a period of 3 or 4 weeks, until you're able to walk briskly for 30 minutes. Doing a brisk 30-minute walk 5 times per week will provide you with a substantial baseline from which to begin to pursue additional forms of exercise. Overall, for most of us physical activity is the best method for returning to good health. Regular chiropractic care will provide significant assistance in your return to peak levels of health and physical performance. 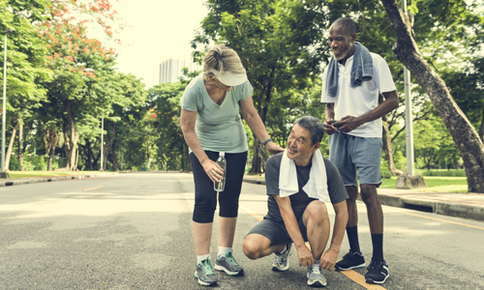 By detecting and correcting sources of nerve irritation and spinal joint dysfunction, regular chiropractic care helps ensure that your body is functioning at maximum capacity and protects your ability to get the most out of your exercise activities. In this way, regular chiropractic care helps you and all the members of your family obtain and enjoy ongoing health and well-being.